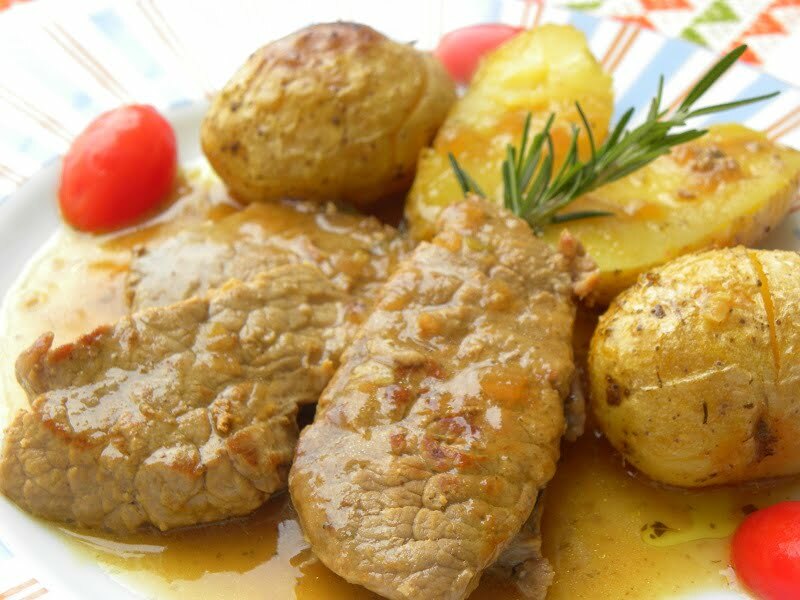 Moschari is veal in Greek and Lemonato is the method of cooking, which means anything cooked with lemon juice. Lemonato dishes can be made with chicken, lamb, pork, liver, fish (anchovies) or vegetables. I have posted a Chicken Lemonato recipe in the past, Lamb Liver Lemonato Ladorigani, Lemony Roasted Potatoes, Gavros Lemonatos Ladorigani and with vegetables, such as my Artichoke Dish (Agginares à la Polita). However, today we will be using veal. Veal in comparison to beef, is very popular in Greece and although I have never cooked beef before, may be it’s time to soon try some beef recipes as well. This veal lemonato recipe is a very popular Sunday meal, which although very simple to make it is so delicious. The meat cut which is suitable for this dish, apart from the round that I used, chuck, brisket or rump are also good for pot dishes. I chose the round because my children don’t like fat in the meat, so it’s the leanest of the cuts. The meat is cut into thin slices and fried in olive oil in order to reduce the cooking time. It can also be made with bigger chunks of meat but it will need more time of cooking. The pieces of meat added to be frying pan must not be too many, as otherwise the meat will not fry properly. Also when removing the fried meat to the pot, I leave a couple of pieces in before adding some more, to keep the temperature of the oil steady. I fried the meat in three batches and at the end you can see that the frying pan looks as if the oil was burnt. However, those sticky residues left (the fond) are those that will give flavour to the dish. When adding the onion, I mix and scrape the frying pan well, to that all those particles which stick to the frying pan can be removed while the onion is sauteing, then I add the garlic and wash anything leftover with water. Instead of the water, you can add the wine and add the water after adding the onions in the pot. The lemon juice and seasoning are added at the end, after the meet is tender and soft. It is said that adding salt and lemon juice at the beginning, will make the meat tougher. Before adding the lemon I dissolve some flour in it, which I also pass through a strainer for any lumps to dissolve. This will help bind the sauce and enhance the citrus flavour. If you want to cook the potatoes together with the meat, you can follow my recipe for Kotopoulo Lemonato and fry the potatoes first, remove them to the pot and the remaining procedure is the same as above but you will have to add more water, as the potatoes will absorb all the liquid. However, I love my roasted lemony potatoes, so this time I baked them separately. Wash and cut the veal in thin slices. Let it drain or pat dry. Heat the olive oil in a skillet and sauté the veal in three batches, on both sides. Add the onion and sauté until translucent, scraping the frying pan to loosen up the fond. When the onion is soft, add the garlic and mix for a few seconds and then add the rosemary. Put the pot with the meat on the heat and add the wine. Cook for a few minutes until the alcohol evaporates. Add the mixture of water with onions, garlic and rosemary. Bring to a boil, lower heat, cover with the lid and cook until the meal is tender, for about 1 hour. Dissolve the flour with the lemon juice. Pass it through a strainer to dissolve any lumps. Add the lemon juice as well as the salt and pepper and cook until the sauce thickens. Cook for 5 more minutes to absorb the flavours and let it rest for a while for the sauce to thicken. Serve with mashed potatoes, fried potatoes, rice, pasta or roasted potatoes, as I did.